Building clean anchors is one of the easiest skills and yet probably 50 percent of the teams on El Cap never learn how. All too commonly wall climbers build anchors that end up like a rat's nest. Everything is clipped everywhere. It is hard to tell how well backed up things are, so even more backups are thrown in. In the end, you wind up with a modern art piece that is probably safe—but it is hard to tell since there are so many things clipped in so many places. Then it comes time to free up a rope and it becomes a form of surgery to delicately unclip and reclip things so that everyone stays safe. And where did all my free biners go? Making clean anchors is actually pretty easy, fast and does not require as much gear as the clusterf*#k described above. The first step is to realize that big wall anchors are not the trad anchors you place on a typical multi-pitch climb. 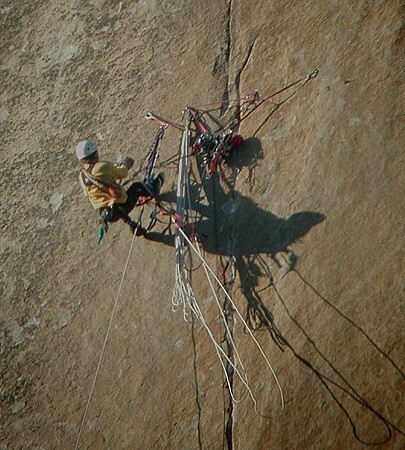 Usually, on a multi-pitch climb, you have one rope and one partner and not much else. In that situation it's okay to toss in a couple if pieces and equalize them. And then maybe tie in another piece with a clove hitch. But on a wall, you just can't do that. Improvising seems more efficient at first but then it turns into a downward spiral as all the elements not present in trad climbs are added in. You have at least two ropes, a lot more gear, haul bags, and sometimes all this takes place at a hanging belay with no ledge to stand on. You need to plan out the anchor in advance. You can't improvise half way through or everything turns to spaghetti. Equalizing three to five pieces with a cordalette. Making clean and simple anchors. The five knots you need. Cordalette, free biners, shoulder-length slings, gear for the anchor, locking biners. You can practice anchors anywhere. Off a rafter in your house, a gym, at the crag. The key thing is to have three to five anchor points within a three-foot radius of each other. This whole chapter probably could have been three words long: Use a cordalette. But I will elaborate a little. First off, make sure the cordalette is not a single continuous loop and instead is a single strand with two figure-eights on a bite at either end. What makes the cordalette magical? It equalizes all the gear in the anchor to one bomber master point. On a big wall belay I like to have three bomber bolts or at least four pieces of good gear. Most of the time there are four pieces of gear in the belay. The cordalette works best when all four pieces are near each other. If you have a piece or two that are off from the main anchor points, you might have to attach a shoulder-length sling to them and tie in the cordalette there. Clip two biners to the master point and fix the lead line. Attach the wall hauler to the master point. Haul. Once the bag gets up, clip it to the master point. Everything revolves around the master point. Simple and bomber. Note: It is good to get in the habit of always fixing the lead rope first, then getting ready to haul. That way, if it is windy or communication is unexpectedly difficult, the belayer will know that the lead line is fixed when the leader starts to haul. There are times, especially on The Nose, where I don’t use a cordalette. Usually, this happens when there are three bomber bolts in a row or two bolts in a row with one over to the side. In this case, you certainly still could use a cordalette and that might be the best option. But I will often just use slings. 1. Figure-eight follow through —The only way to tie into the rope. Also a way to join two ropes for a big haul. 2. Figure-eight on a bite —The best knot for tying into the anchor. 3. Overhand knot —Good for fast applications where you are pretty sure the knot will not be loaded, like tying backup knots while jumaring. If you think you will load the knot, tie the figure eight on the bite because it is easier to untie later. 4. Double figure-eight —The most efficient way to equalize two pieces because it only requires two biners. This knot is best for trad climbs and is not commonly used on big walls. But it is a good one to know. It is especially good for fixing pitches because it helps you save biners and slings. 5. Clove hitch —The knot that uses the least about of rope to tie and is the easiest to tension. Great for bivvies or any application where you want to easily control the tension of the rope. 6. Overhand rappel knot —Great knot for rappelling. Leave at least 18 inches of tail and consider tying a backup knot. 7. Water knot —Used for tieing shoulder-length slings. 8. Girth hitch —Great for attaching two slings together to either improve an Aider or eliminate rope drag on a pitch. a small typo at the beginning of second paragraph. "All to (too) often..."
"First off, make sure the cordalette is not a single continuous loop and instead is a sing strand with two figure eights on a bite at either end." Think that was "instead is a single strand"
Somethings I came across on the wall and never see addressed in the How-to-books available. 1)Haul pulley goes on top of everything. Don't put your fixed line on top of the hauler...if you get the bag up to the anchor before your partner is done messing around, their weight will trap the haul pulley if you want it off before they get their weight off. 3) The side you clip the bag to. If you will be traversing right, put the bag on the right hand side of the anchor. Sounds simple and almost obvious but with a hanging belay, 3 person team, and a almost horizontal traverse...it's a bear (or a pig) trying to get that dam bag around two people if you don't want to drop it and watch it fly (if it is not on the side it's going to be going). 4) Put hauler high if you can. The lower the worse off. If the bolt is bomber looking, just slap it on there and starting pumping. Otherwise you gotta lower yourself 15 feet just to begin...and that is time consuming. Just my 2 cents worth. The more parties that don't get hung up at belays = less wait on popular routes. Put commas to separate names of the affiliates. Near the end you mention and describe 9 knots everyone should know but earlier mentioned there were 5 knots that everyone should know for big wall. Change the 5 to a 9. Lastly, when you're satisfied with the article think about doing some house cleaning on these comments...I don't think it hurts to show the development process, but then again I don't think anyone will be insulted if you decide to clear the comment space for the inevitable listing of thanks for such a good article, questions, and alternative ideas. You can trim out these 'correction notes' as you see fit. Again, well done, and thanks for this and all the other great things you are doing with ST.
good explanation about the cordalette, but which length do you prefer? And some pictures would help to imagine how a good wall belay should look like. I agree with the comments suggesting to include some pictures and to discuss arrangement of the belay & things that are attached to it: gear, climbers, haul bag, etc. in various scenarios. Also discussing the arrangement in three dimensions: above/below, left-right, front-back of the different tensioned layers of rope. I've found that my biggest problem with hauling at an anchor is accidentally getting these layers crossed or accidentally pinching things down that need to be freed. Doh! Great book and instructional videos! Any word on when this is expected to be finished? generally informative, but cordelette isn't defined here. I assume you are talking about a conventional cordelette -- a single strand of 7mm nylon cord, length around 17-20 ft.
as for the figure 8's on a bite (sic), that means a tail coming back toward the middle of the rope, right? how long should this tail be? Thank you for a great article. I´ve red this article (http://www.drivenoutside.com/tipstiddybelay.htm); earlier and found it a lille cluttered. When the figure-eight follow-through is used to join two ropes, it is called a Flemish Bend. This whole chapter probably could have been three words long: Use a cordalette. Change capital "U" to lower-case "u." ...a single strand with two figure-eights on a bite at either end. Change to "...a single strand with a figure-eight on a bight at either end." No illustration or description of "the way" follows this. "into" should be "in to." I always thought that it was a 'bight' of rope? But maybe that's an older English/American English spelling thing? In the book you mention the trick to clove the lead line into the last piece if it is bomber. I found this to be one of the better tidbits in the book. Keeping the weight of the follower off the powerpoint makes it much less of a hassle to use the power for both hauling and for the follower, especially if the last moves are traversing. "In the book you mention the trick to clove the lead line into the last piece if it is bomber." Well, if you like untying weighted clove hitches, this is OK. However the Better Way is to instead use an alpine butterfly tied in the lead rope, which is hugely easier to untie. You can use the last piece or two, or even one of the anchor bolts. But yeah, either way, it keeps the weight of the cleaner off of where you're working. When possible, I like to have the main anchor, usually a cordalet, to do the hauling off of since this is the most strain you get on your anchors in normal circumstances. I then set things up so the person following the pitch jugs from a clove hitch on the lowest piece in the anchor, or the last piece on the pitch, backed up by a figure 8 into the cordalet strong point or on the beefiest bolt. Doing it this way keeps the rope your partner is cleaning on,off to the side & out of the way of the haul, making things much cleaner. If you ever have had to jug thru the haulbags & clean a tough pin, you'll really appreciate things more if you could have positioned the second off to the side for cleaning the pitch. When your partner arrives & is ready to lead out on the next pitch, you don't have everything clusterf#%@ed at one point. Under coralete and Figure 8 on a "bite"
I think "bite" should be "bight" This isn't a Canadianism; I think it's the correct spelling in English everywhere. Thankyou for all the helpful info. I'd really like to know what you were about to say after ..."on a climb like the nose, I use slings in the following way"? I just finished the nose for the first time last month, and the whole way up I kept experimenting with different anchors, but haven't found a system I like yet. I'd love to hear how you anchor for a two bolt belay with hauling and block leading!